Australia has the best Off-Grid technology in the world, its Outback dwellings are off-Grid with over 50 years and the technologies developed are among the best in the world. In the Northern Hemisphere inefficient, expensive above ground 35 degree/30 day cycle Mesophilic Anaerobic Digesters dominate the market. 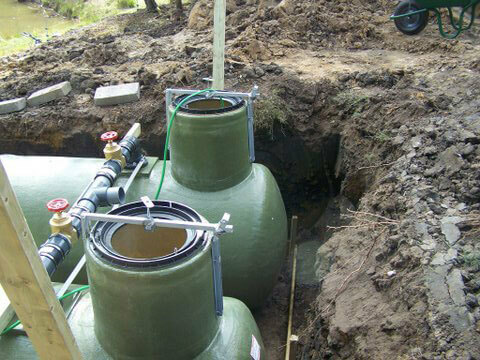 In the Southern Hemisphere, underground, gravity operated, 80 degree/10 day cycle Exothermlic Anaerobic Digesters were developed by off-grid specialist Peter Webb. EAD's operate at 80 Degrees and produce 3.5 times more Methane (CH4) per kgDM of waste than Mesophillic Digesters. The higher temperature reaction reduces the digestion process from 30 days to 7 days, reducing the size of the tanks required and lowering the system cost. The dual digester system prevents disrupting the Exothermic Anaerobic bacteria in the digesting chamber while the second is being filled. The optimum digester temperature and efficiency is maintained in the digesting chamber (producing Methane Gas CH4) while the second chamber is in the loading mode. 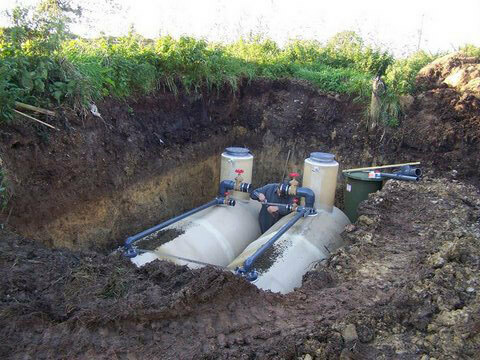 A third smaller dosing chamber is installed to take the excess water prior to discharging to either the transpiration lines or soakage fields. When the presence of methane (CH4) is detected and the pressure is at 10 kPa, the pressure increase passively transfers the excess water from the digestion chamber to the loading chamber and maintains the correct operating pressure. To maintain the Exothermic reaction the digesting chamber temperature should never drop below 65 degrees centigrade. 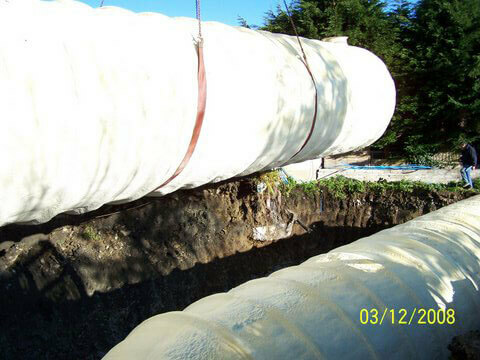 The operating temperature can be adjusted to suit the best anaerobic action for the type of digester feed. 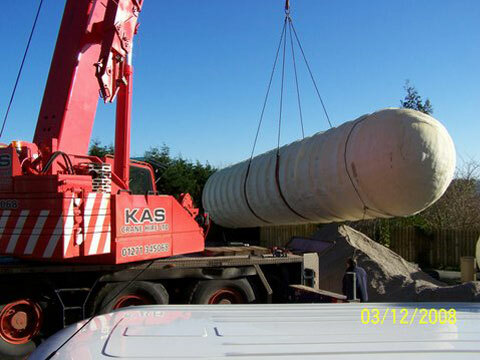 The above large Industrial 80,000L tanks are being installed on a farm to produce Bio-gas from animal waste, forestry biomass feedstock can and cellulistic waste can also be used. 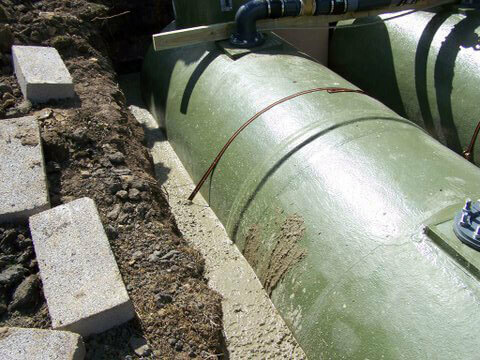 Prior to installation the tanks are pressure tested to 5bar, after they're fitted into the ground they're plumbed, pressure tested again and an insulating layer of foamed concrete is poured around the tanks. Light vehicles can drive over the non serviced section accounting for 90% of the tank area.